If Hamlet had been a gardener, his question would have been “to stake or not to stake?” As with so many gardening questions, there’s no one right answer. Your decision will vary according to the variety you grow, summer wind and rainfall, available time, material and other considerations. If you expand the question to include the issue of trellises, cages, poles or tomato tables, it gets even more interesting. Vampire elimination aside, stakes are useful for many purposes in the garden. Plants generally divide into four groups: true vines, ramblers, floppers and uprights. Typical uprights in the vegetable garden are nice little soldiers that stand at attention — asparagus and artichokes come to mind. Ramblers are the summer squashes; they aren’t really viney, but they do tend to expand and creep a bit. Melons, squash, cucumbers and pole beans are vines. Floppers, to my mind, are things like tomatoes. They don’t have the tendrils common to squash and beans, so they can’t really climb, but they’re too heavy to just grow straight up like asparagus. Floppy plants often behave better with a stake or three in many instances. For some things, staking is optional. You don’t have to stake tomatoes. They will happily sprawl over the garden, sending up vertical shoots that will blossom and bear fruit. Disadvantages: they take up more space that way and it’s more difficult to weed unstaked tomatoes. They may also tend to pull up at the roots in the process of flopping. It’s less work, however. Staked tomatoes are easier to weed, the fruit may be less likely to get eaten by ground-dwelling insects and it’s also easier to succession plant in between them. For indeterminate tomatoes, plan on stakes that are at least six feet above the ground, as indeterminate can be loosely translated as “will just keep growing…” You don’t have to stake peppers and eggplants, either, but I find they do better, because they are likely to fall over once they start to fruit if we have a lot of wind and rain or if a dragging hose whacks them at the base. Some folks will tell you staked tomatoes (or whatever) are more productive. I think it depends. An unstaked tomato sort of rambles across the ground, sending up vertical shoots along its length. These blossom and bear fruit. Since the verticals are relatively short, they can often handle the weight of the tomatoes as they ripen, which keeps them off the ground. 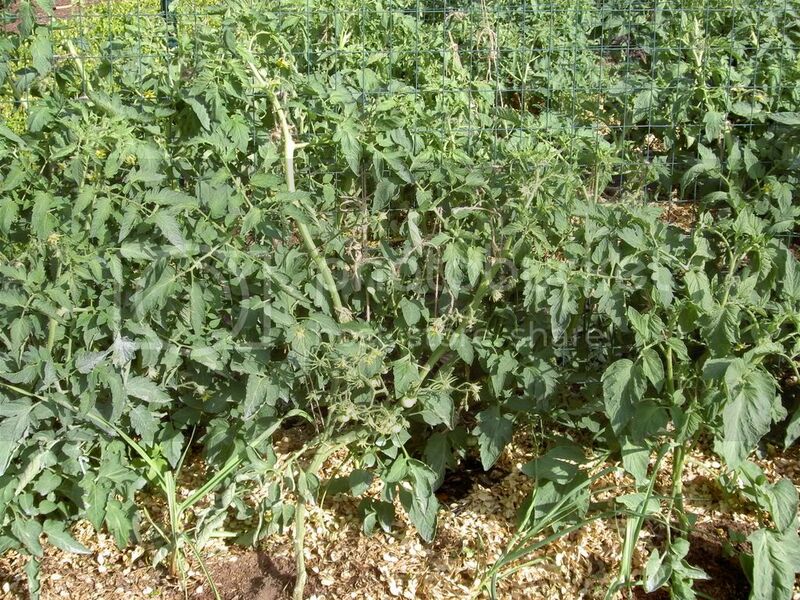 Unstaked tomatoes tend to shade out weeds and their leaf canopy also helps trap moisture in the soil. It’s easier to pinch out suckers on staked plants, however, which keeps the plant focused on fruiting instead of making leaves. It’s also easier to weed around staked plants and if you’re an intensive gardener who wants to cram a lot of other crops in your space, staked plants make it easier to cram and succession plant. Unless you want to harvest them on your knees in the middle of a jungle, plan to stake or trellis your pole beans and peas. Although these both come in bush varieties, I prefer pole beans and peas because they’re much more productive, and I think they taste better. Some vigorous varieties will grow 10 feet or more. 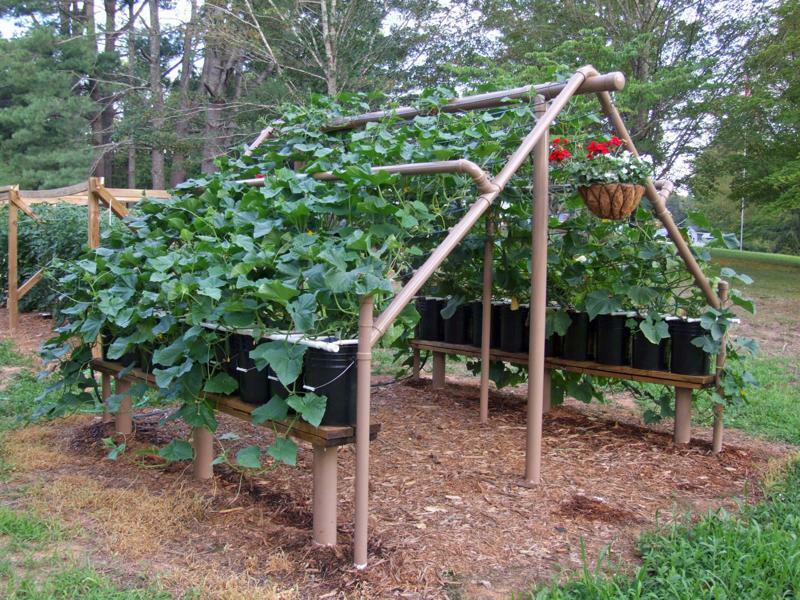 Cucumbers can be staked, although I think they do better either sprawling or grown on a trellis or the flat version of a trellis known as a tomato table (think four uprights with an open latticework horizontal rectangle attached to the uprights). This allows them to crawl up the legs and sprawl over the top, while their fruits hang down through the holes in the lattice. Easy to keep clean and easy to pick. Variety matters, in my experience. Hybrids, especially of peppers and eggplants, tend to have a sturdy center stalk that can stay upright while ripening the peppers. Since many hybrids are bred for mechanical harvesting, however, you trade that rigid center stalk for taste and variable ripening times that allow you to process small amounts rather than being overwhelmed by produce when you’ve already got more than enough to do. So, make your choice and do what works best for you. This entry was posted in Farms, Food and tagged eggplants, garden, Hamlet, hybrids, peppers, stakes, tomatoes, vampires. Bookmark the permalink. 5 Responses to What’s at Stake? Do you have plans or instructions for building the above ground bean house? Hi Shellie – If you’re talking about the fourth picture from the top, no, I don’t. I borrowed the picture from a website called The Prepper Project, and the link there isn’t much help either: http://www.pvcplans.com/trellis.htm. It looks as though it would be pretty easy to figure out, though. Pingback: Trellis Your Green Beans! 7 "How To" tips. Tomatoes grown on stakes are commonly a little larger on average than tomatoes grown on unstaked plants. That’s because staked tomatoes are usually pruned to the stake allowing more energy to flow to the plant’s ripening fruit. Harvest generally comes earlier for staked tomatoes. That makes good sense, Truman. Thanks for stopping by and commenting!